The Giant Forest Hog is known to be the biggest member of the Suidae, a pig family and is actually the only member of the Hylochoerus genus. These hogs present an intimidating appearance with males being as much as two meters in length and 1.1 meters high and can weigh as much as 1,100 pounds! There are various reports of these hogs being even bigger taller, but many of these are urban legends that cannot be documented. It is not only their size that makes these hogs stand out, it is also the covering of hair over most of their body. The hogs and their hair are usually black, though many of the Giant Forest Hogs have been seen with an almost orange colored hair covering the body. This hair is known to become thinner as the hogs age, much like humans. The species also has very pointy, large ears and it has sizable tusks. Though these animals cannot be made into pets, they are not as vicious as many other wild hogs in the region are. One can generally hear this species coming as the Giant Forest Hog is known to be very loud and vocal. The species uses unique snorts, grunts, and barks to communicate with one another whether they are very near to one another or great distances. Each group seems to have its own language. The Giant Forest Hog can be found in the jungles in West and Central Africa and they can also be found in the Rwenzori Mountains and even on Mount Kenya and Ethiopian Highlands. 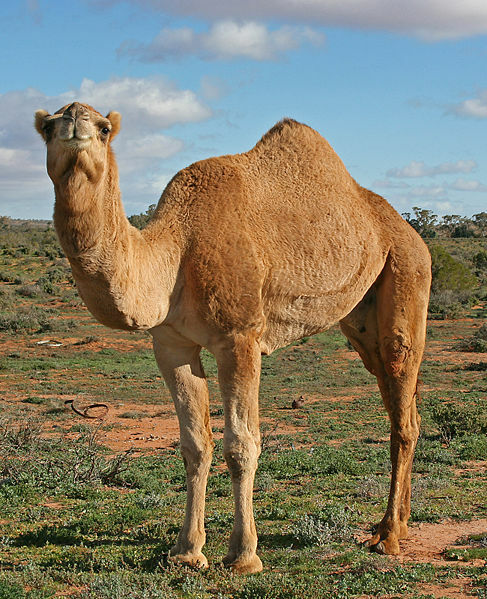 The animals are found in large groups of up to twenty, though mating couples will break away from the group as they need plenty of space for breeding. The Giant Forest Hog is an omnivore. These animals generally feed on whatever is abundant in the regions in which they live including grasses, roots, leaves, fruits, and carrion. Young are usually born to the Giant Forest Hog during January and February or July and August, as these are the periods just before the rainy seasons. The young are born into a nest that the female has created on her own, away from the rest of the group. The nest is usually about 13 feet in diameter and five feet tall and is meant to protect the young from predators. The female will usually have two to six young and the babies will be nursed for up to 10 weeks and can nurse from any of the females of the group. The male hogs will be sexually mature at three to four years of age and the females at one year of age. The Giant Forest Hog generally lives for up to 12 years. The young are protected by the entire group, of which the males are the most prominent defenders of the group and piglets respond to warning calls by lying flat on the ground under an adult. Like the information on the giant forest hog. Giant forest hogs are also found in Aberdare National Park in Kenya. I have a hog an my land. Hogs are AWSOME! 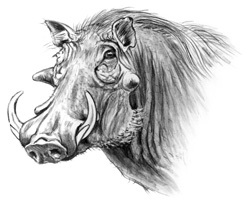 Your Drawing is of a Warthog not a Giant Forest Hog….